YouTube is a fantastic source of information. There is seemingly a video on any topic you can imagine. If a picture is worth a thousand words, then a video can be worth millions of words. Indeed, this is why I previously noted that you might need to submit a video on an information disclosure statement as non-patent literature. See What Different Types of Art Must be Cited to the USPTO?. So how do you take a video and turn it into something that can be submitted as an NPL document as part of an information disclosure statement? You need to convert it into a PDF document. Locate the video you want to submit as an NPL document. Copy the URL (e.g., https://www.youtube.com/watch?v=DjO1PjnTOFE). Download a copy of the video for your records using an online tool that allows for the downloading of videos. On the first page, create a cover page containing a citation number that will be used in the IDS form (e.g., Cite No D013) to help the Examiner identify the document. 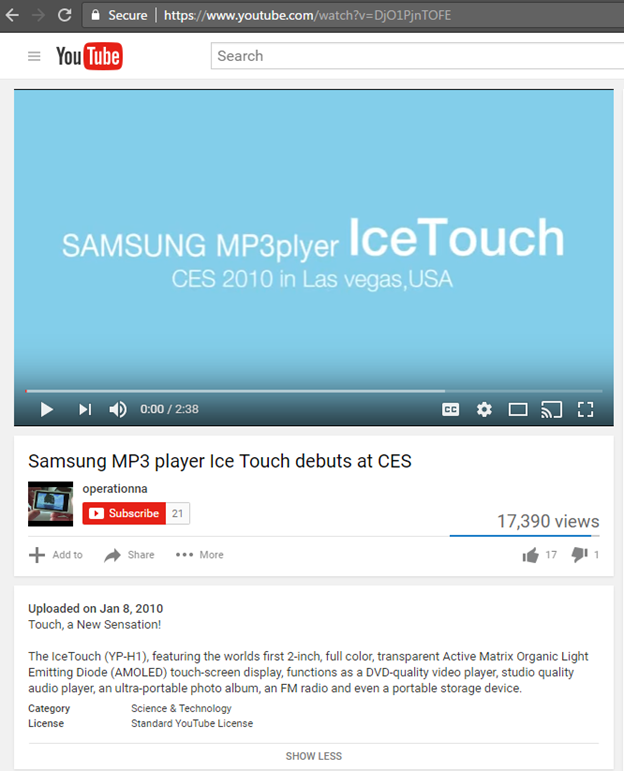 Below the screenshot of the video information, paste in the automated time-stamped transcript from YouTube which you can find by clicking the "… More" button and selecting "Open Transcript" from the sub-menu. Select the text from the transcript window that opens, copy and paste it into the document. Then, fix the formatting and typographical errors as you watch the video. During regular prosecution, you do not need to worry too much about establishing background information relating to accessibility and public dissemination. "In the Acco case, in which claims were invalidated using the on-line ClickSave video, the Petitioner provided declaration testimony from a ClickSave director responsible for launching the ClickSave line of computer lock products." "In light of cases like Intex and Acco, it appears that the PTAB is willing to accept videos as printed publications, at least under the right circumstances. Those circumstances include, of course, the establishment of a proper foundation of the video, including authentication of the content of the video and dates of dissemination and accessibility. For content, the PTAB, in cases like Acco, seems willing to rely on annotations of printed screen shots from the video, such as annotated still frames." See O'Neill, "Videos as a Printed Publication in Inter Partes Review," IPWatchdog (Dec. 5, 2016). In the next post, we will discuss defenses based on patentable subject matter.